To create an original interior, it is important to use non-standard solutions, for example, niches or recesses in the walls. 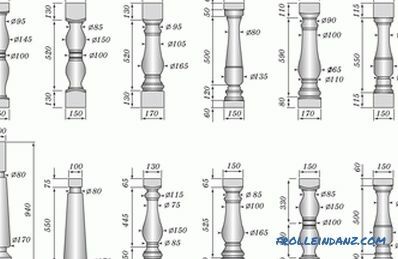 Most often they are mounted in the bedroom for an unusual design of the head of the bed, but in fact with the help of niches you can solve many problems. 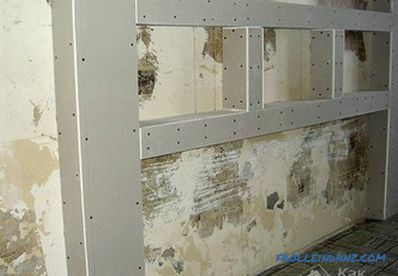 Aluminum profiles and drywall are used for the installation of the structure - common construction materials that are often used in the finishing works. 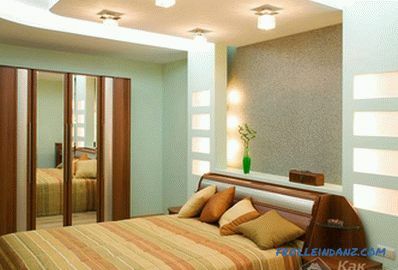 In this article we will discuss how to make a niche in the bedroom above the bed by completing all the steps yourself. efficiency (with proper work and thoughtful decor will get a beautiful design). 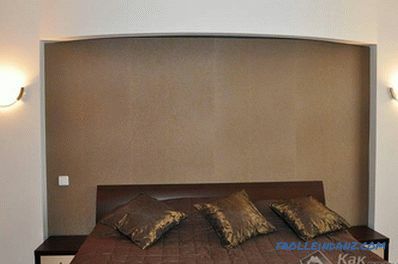 Plasterboard niches can be of two types: deep and decorative. 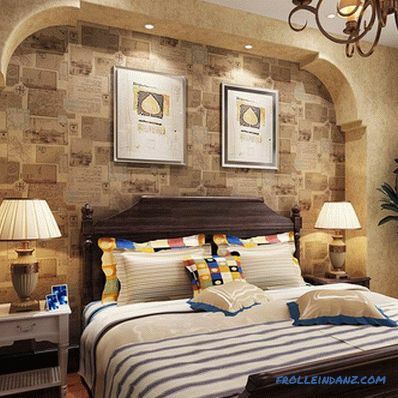 Deep niches are designed for double and single beds. 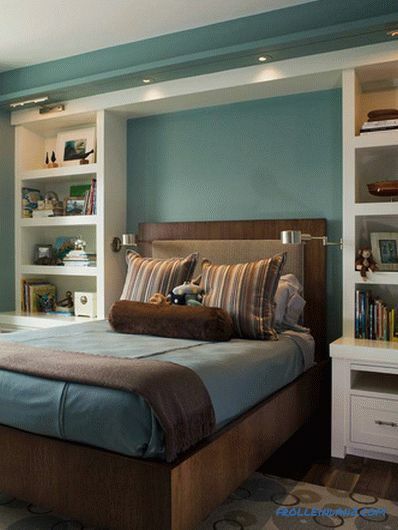 This design can be supplemented with shelves and decorative lighting. In the lower part you can equip a place to store things (for example, bed linen). Decorative niches are designed to create shelves for TV, home theater and to accommodate tuners. In addition, using a small niche and a mirror, you can visually expand the space, and you can use other materials to create an original decor: photo wallpaper, textiles, glass, textured plaster. Niches can be vertical, horizontal, functional, decorative, and also floor. 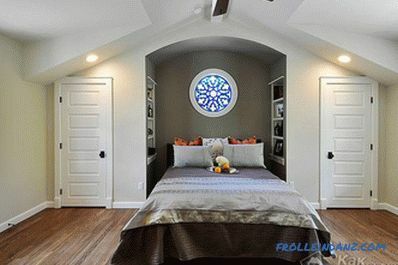 A niche in the bedroom in most cases is built above the bed, while it can be placed both on the whole wall and on one part (half), which will allow to divide the room into 2 zones (bed + dressing room). 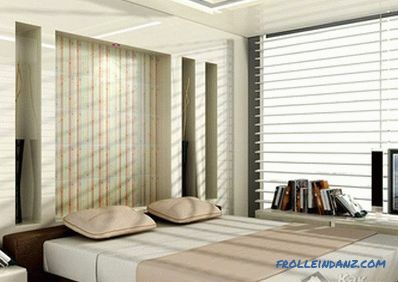 For greater effect, it can be supplemented with transparent shelves and lights. 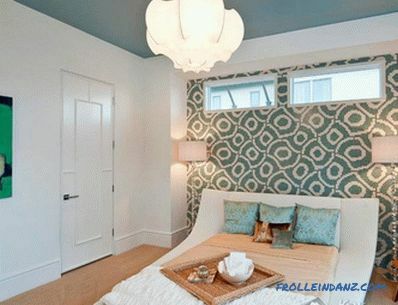 To emphasize the depth of a niche you should use several colors with bright accents. The design can be varied: one large niche or several small different sizes, which are placed in any order. 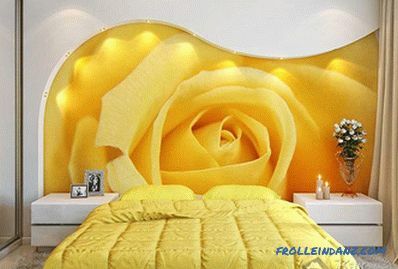 The most efficiently illuminated niche will look in the evening. To do this, you can use spotlights and ribbons with LEDs. 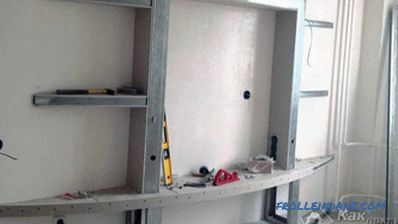 Assemble niches with your own hands is quite simple. This is done in 3 stages. At the first stage, the design is developed, markup is applied, and the frame is made from an aluminum profile. All elements are fastened with a perforator and dowels. If the shape of the niche is non-standard, then it should be calculated in advance. 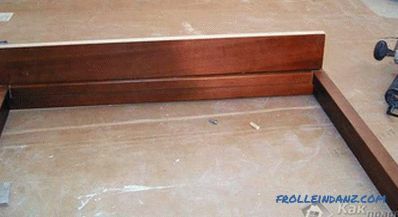 First, horizontal profiles are fixed along the floor and ceiling, and then vertical ones are attached to them. 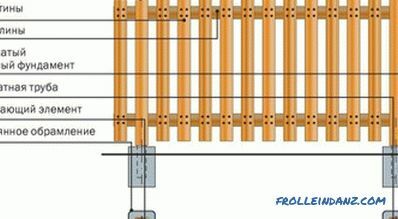 To add rigidity to the whole structure, an additional profile is used. At the second stage it is necessary to sheathe the entire structure. To cut out the necessary element from drywall, you can use an electric jigsaw or a special knife. When placing the backlight is to pre-lay all the wiring inside the structure, so that it was invisible. 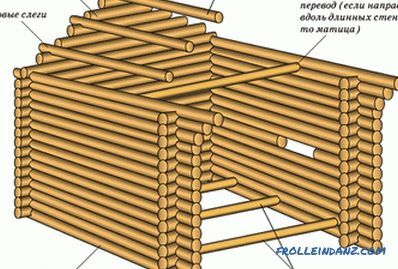 At the final stage, the prepared structure must be completely filled. Do not forget to put on the joints a special serpentreous tape that will strengthen them, and fix special leveling corners at the corners. Also fastener places (caps of self-tapping screws) are carefully puttied. After complete drying, it is necessary to begin decorating the prepared surfaces, but before that do not forget to wipe them well with an emery paper, to remove irregularities and make the surface smooth. To finish materials lay well on the surface, it should first be primed. 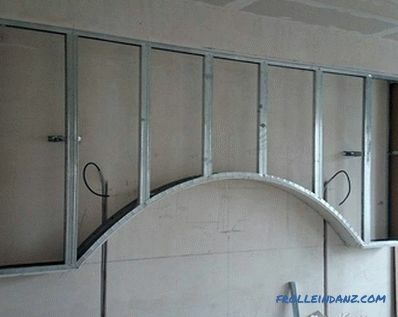 At each stage, the construction level is used to create a perfectly smooth wall with niches. artificial stone, mirrors and glass. Paint can be applied immediately to the prepared surface, as well as glued and wallpaper. When choosing a plaster worth reading the instructions on the package. 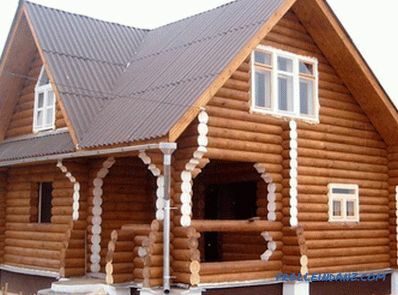 Plastic, wood and other decorative materials should be fixed with special glue or liquid nails. The perimeter of the niche can be additionally decorated with products made of stucco, which are also fixed on liquid nails. When using spotlights, prepared niches and all wires are laid during the installation of the structure, and after decoration are inserted and fixed. Ribbons with LEDs of different colors can be laid on the lower inside of each niche or along the entire length at the bottom. Glass shelves will create an airy design. Shelves can be located on several pieces in each niche. 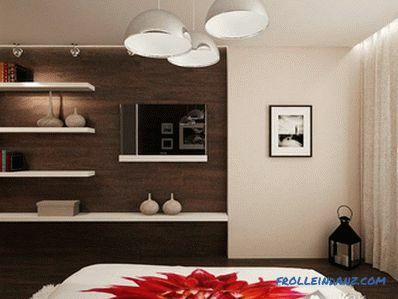 There are many options for decorating niches in the bedroom, but if it is one big niche, you should order a photo panel that will serve as an original decoration of the room. It should be remembered that the modern plasterboard niche is a unique multifunctional design that will fit into any interior.